Today a free crochet patterns for Kindle and other tablets page that I once had published at another location has been moved to Working Grandmothers. It had many visits at it's old location, and I hope that it will bring pleasure to visitors here. 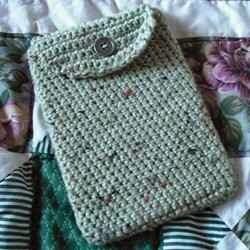 The pattern can be found here - Crochet a Kindle Tablet Cover - Free Crochet Patterns. All posts leading to crochet patterns can be found in "Posts by Topic" in the upper right of this page under "Crochet". Image: My own - free to use if you provide a link back to this post or the page linked to in the post. Thank you.